Beaphar Household Flea Fogger has been developed to target all life stages of fleas; effectively and quickly killing adult fleas, larvae and eggs. Also effective against insect and mite infestations, the Beaphar Flea Fogger also includes a fast-acting insecticide to kill adult fleas and an Insect Growth Regulator (IGR), which prevents the development of larvae and eggs, therefore breaking the life cycle. 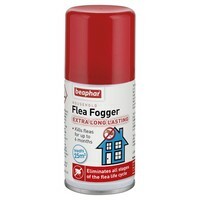 The effect of the Beaphar Flea Fogger is immediate and due to the prolonged action of the Insect Growth Regulator, the home should be protected for up to 6 months. Tiny droplets produced will allow the active ingredient to reach any eggs, larvae and adult insects hidden within carpets, skirting boards and cracks in the floor.